By most accounts, the Fatah-Hamas unity deal signing ceremony Wednesday was a grand affair. Hamas terror-chief Khaled Mashal jetted in from Damascus. PLO/Fatah/Palestinian Authority chief Mahmoud Abbas flew in from Ramallah. The ceremony was held under the auspices of the newly Muslim Brotherhood-friendly Egyptian intelligence services. UN representatives and Israeli Arab members of Knesset were on hand to witness the "historic" accord which officially put the PLO in bed with the Hamas, the Palestinian branch of the Egyptian Muslim Brotherhood and a terrorist organization dedicated to the annihilation of Israel and the establishment of a global caliphate. No less significant than the pact itself, are the lengths the Left is going to obfuscate and belittle the importance of what happened. In Israel and abroad, leftists have used three means to hide the meaning of the pact from the public. First, some have upheld the deal as a cause for celebration. Wednesday, the senior political commentator of Israel's Channel 10, Raviv Drucker, opined that the deal may increase the chance of peace between Israel and the Palestinians. Ignoring the fact that the pact paves the way for Hamas's integration into the PA's US-trained security forces and membership in the PLO, Raviv vapidly claimed that the villain in all of the recent developments is none other than Prime Minister Binyamin Netanyahu who is destroying all chance of peace by pointing out that the Palestinians have opted for war. On the world stage, Drucker's case is being made by former US president Jimmy Carter. In an op-ed in the Washington Post on Wednesday, Carter similarly praised the deal as a step forward. Never mentioning the fact that Hamas is a terrorist organization, Carter claimed that the deal will enhance Palestinian democracy. It will also increase chances for a ceasefire between Hamas and Israel and peace between Israel and the Palestinians, he promised. The second way the leftist establishment is trying to hide the game-changing nature of the Fatah-Hamas deal is by belittling it. Most of the Israeli media for instance highlighted remarks by outgoing Shin Bet chief Yuval Diskin asserting that the agreement is likely to be short-lived. The New York Times too, emphasized the deal's high chance of failure. But whether it succeeds of fails is irrelevant. The point is not that Fatah and Hamas don't like one another. They point is that they are terrorists. Finally, voices in the Left have sought to hide the importance of the agreement behind bureaucratic illusions. For example, the Obama administration is using the artificial distinctions between Fatah - led by Mahmoud Abbas, the PLO - led by Mahmoud Abbas, and the Palestinian Authority - led by Mahmoud Abbas to claim that there is no reason to get excited. Since the PLO signs the deals with Israel, and the PA pays the bills, the State Department has argued that the fact that Fatah signed a unity agreement with Hamas won't have any immediate impact on US aid to the PA.
Abbas himself has gone out of his way to encourage this notion. During his meeting with a delegation of far left, retired Israeli security brass last week, Abbas said there is no reason for concern about the agreement because the PLO, which he leads, rather than Fatah, which he leads, carries out negotiations with Israel. The reason that otherwise intelligent people are willing to make such obviously absurd statements is because they are in a state of panic. They realize that the Fatah-Hamas unity deal discredits the land-for-peace paradigm. If the public is permitted to recognize the importance of what has happened, then that policy will be abandoned. All Israeli and US support, recognition and legitimization for the Hamas-partnering PA/PLO/Fatah will have to be ended. The Left's panic was revealed Wednesday in a Haaretz report of a classified Foreign Ministry report regarding the unity deal. Written by unnamed officials at the ministry's leftist-dominated policy planning division, its authors rebuked the Netanyahu government for condemning the agreement. They claimed that the deal represents an opportunity for Israel. They further called on the government to "be a team player and coordinate its response to a Palestinian unity government with the [Obama] administration." Doing so, the authors claimed, "will empower the United States and serve Israeli interests." Obviously displeased with the government's failure to heed their ridiculous advice, the diplomats released their cable to Haaretz in a bid to intimidate Israel's elected leadership into submission before it is too late. This is not the first time we have been at the point of recognizing the truth - that the PLO/PA/Fatah never turned its back on terror and that all the commitments it has made to Israel have been subordinate to its commitment to maintaining its support for terror. We were here in 1990 and again in 2000. In 1990, PLO chief Yassir Arafat refused to condemn a seaborne terror attack on Ashkelon and Tel Aviv carried out by the PLF faction of the PLO. As is the case today, Arafat tried to characterize the subordinate group as an independent organization in order to deny his own culpability for their crime. At the time, the US was engaged in a dialogue with the PLO facilitated by the group's November 1988 professed recognition of Israel. Faced with this clear breach of good faith, the US Congress and the Shamir government demanded that then president George H.W. Bush cancel US recognition of the PLO and end its dialogue with the terror group. Although Bush had been a great champion of US-PLO relations, he had no choice but to agree to this obviously justified demand. A year later Bush rejected the notion of reinstating his recognition of the PLO in 1991. Speaking to reporters he said, "To me, they've lost credibility. They've lost credibility with this office right here." In 2000, Arafat again lost credibility when he rejected then prime minister Ehud Barak's offer of peace and Palestinian statehood at Camp David, joined forces with Hamas and launched the terror war against Israel. 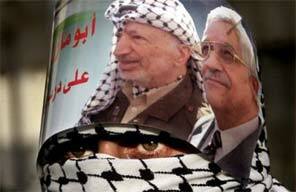 Upon returning from Camp David, Barak bragged that he had taken the mask of peacemaker off of Arafat's terrorist face. But Barak's peace-crazed leftist voters weren't interested in the truth. Just as they are condemning Netanyahu now for acknowledging that Abbas's deal with Hamas proves that the PA is uninterested in peace with Israel, in 2000 the political Left responded with vitriol to Barak's announcement. From their great leader, he became their worst enemy. Barak's supporters' decision to prefer their ideological commitment to the peace paradigm over their commitment to their country or the facts on the ground made it impossible for Barak to act on his revelation. If he wished to have a political future, the only thing he could do was obey his voters, and put the mask back on Arafat's face. After all, the Right, which opposed his massive concessions, would never vote for him. So Barak dutifully elevated uber-leftist and then justice minister Yossi Beilin to the head of his negotiations team. He empowered Beilin to make even more far reaching concessions to Arafat at Taba, even as Arafat's security forces were lynching IDF soldiers and planning, financing and ordering the suicide bombings. Today the situation is closer to 1990 than to 2000. As in 1990, the US Congress fully supports ending US funding, recognition and support for the PLO/PA/Fatah. Even before the deal was announced Cong. Ileana Ros-Lehtinen, Chairman of the House Foreign Relations Committee had already called for ending US financing of the PA in light of its refusal to negotiate peace with Israel or recognize Israel's right to exist. Immediately after the unity deal was announced, Ros-Lehtinen reinstated her demand that the US end all support for the PA. Ros-Lehtinen noted that since Hamas is a terrorist organization, the US government is legally barred from providing it with assistance or recognition of any kind. Senator Mark Kirk has led efforts in the Senate to end US aid to the PLO/PA/Fatah in light of the unity deal. If Netanyahu follows the advice of his leftist critics and cooperates with the Obama administration in its apparent bid to ignore the legal and policy significance of the Hamas-Fatah deal, he will undermine Congress's ability to support Israel. No American lawmaker - or presidential candidate - will want to be more pro-Israel than Israel's Prime Minister. And if Netanyahu bends to the will of his leftist critics he will stop these welcome initiatives in their tracks. So far, Netanyahu has been holding strong. His government's decision to freeze tax transfers to the PA in response to the agreement with Hamas has sent a strong signal that Israel is withdrawing its acceptance of the PA as a credible peace partner and now views it as a terrorist entity. This move will facilitate swift Congressional action to defund the PA and limit the administration's ability to pressure Israel to make further concessions to Abbas. From the perspective of US-Israel relations, the Fatah-Hamas unity pact couldn't have come at a more crucial time. Netanyahu's speech before the Joint Houses of Congress on May 24 provides the premier with a rare opportunity to radically alter the terms of reference for the discourse on the Palestinian conflict with Israel at home and in the US. If he continues to highlight the PLO-Hamas alliance, Netanyahu can drive the political discourse away from the false narrative of Palestinian peacefulness and towards the truth about their devotion to terror and war. With just one address, Netanyahu can potentially do more to strengthen and safeguard Israel than he has in his entire career. And in so doing, he will guarantee his place among the ranks of great statesmen. Politically, Netanyahu has much to gain by remaining on offense and much to lose by surrendering. Unlike Barak's voters, Netanyahu's voters know that the discredited land for peace paradigm has failed, and they will reward Netanyahu for speaking the truth. On the other hand, if he bows to leftist pressure, and empowers Obama to demand still more Israeli concessions to the Fatah-Hamas government, Netanyahu will place his political future in jeopardy. His voters are liable transfer their support to Foreign Minister Avigdor Lieberman or one of his Likud ministers. They will not understand why they should vote for Netanyahu only to get Barak's policy. International affairs rarely provide the opportunity to correct past mistakes. If Netanyahu does the right thing, he will be attacked viciously by the mindless supporters of endless concessions. But their condemnations will be drowned out by hoots and cheers of enthusiastic support from the overwhelming majority of the public at home, and Israel's friends in Congress and throughout the world. They will thank him for freeing us all finally from the myth of peace with terrorists.